^ 原文：We thought about the developers as our main customers. In particular for GameCube, we spent three years working with Nintendo of America and with all sorts of developers, trying to understand the challenges, needs, and problems they face. First among these is the rising cost of development. The GameCube can see high performance without too much trouble; it isn't a quirky design, but a very clean one. It was important we didn't require jumping through hoops for high performance to be achieved. On top of that, it is rich in features, and we worked to include a dream group of technical features that developers requested. ^ Martyn Williams. Nintendo unveils Gamecube launch plans. CNN. 2001-08-24 [2013-03-16]. （原始内容存档于2013-09-29）. ^ Nintendo reports record GameCube launch. CNET. [2013-03-16]. （原始内容存档于2013-10-01）. ^ NEW MEDIA | GameCube price dropped. BBC News. 2002-04-22 [2013-03-16]. ^ Nintendo ends GameCube support. Market for Home Computing and Video Games（英语：Market for Home Computing and Video Games）. 2007-02-22 [2011-01-16]. （原始内容存档于2016-06-01）. ^ 5.0 5.1 Consolidated Sales Transition by Region (PDF). Nintendo. June 2011 [2011-09-04]. （原始内容 (PDF)存档于2011-07-28）. ^ At Long Last, Nintendo Proclaims: Let the Brawls Begin on Wii! (新闻稿). Nintendo. 2008-03-10 [2008-03-11]. （原始内容存档于2008-05-13）. The previous installment in the series, Super Smash Bros. Melee, is the best-selling game for Nintendo GameCube with 7.09 million copies sold worldwide. ^ 8.0 8.1 8.2 8.3 Buchner, Greg. ATI Discusses GameCube Graphics (訪談). IGN. 2001-10-29 [2014-06-25]（原出处存档於2014-05-01）. ^ 9.0 9.1 9.2 Nintendo Press Conference Transcript. IGN. 1999-05-13 [2014-06-25]. （原始内容存档于2014-07-14）. ^ 10.0 10.1 10.2 Parker, Sam. Nintendo tweaks GameCube's specs. ZDnet. 2001-06-06 [2014-06-25]. （原始内容存档于2014-07-14）. ^ 11.0 11.1 It's Alive!. IGN. 1999-03-12 [2014-06-25]. （原始内容存档于2014-07-14）. ^ Say Hello to Project Dolphin. 1999-05-04 [2013-07-08]. （原始内容存档于2013-07-14）. ^ ATI Snags Dolphin Graphics Chip Designer. IGN. 2000-02-16 [2014-06-25]. （原始内容存档于2014-07-14）. ^ Satterfield, Shane. Nintendo's GameCube Unveiled. GameSpot. 2000-08-24 [2016-04-11]. （原始内容存档于2015-09-05）. ^ First Quarter Financial Results Briefing Q & A. Investor Relations. Nintendo Co., Ltd. 2009-07-31 [2010-06-18]. （原始内容存档于2010-03-30）. ^ support.nintendo.com. Nintendo of America. [2011-04-23]. （原始内容存档于2010-12-14）. ^ 17.0 17.1 Fielder, Lauren. E3 2001: Nintendo unleashes GameCube software, a new Miyamoto game, and more. GameSpot. 2001-05-16 [2013-07-08]. ^ Hinkle, David. Year one: GameCube vs. Wii. Joystiq. 2007-11-19 [2013-07-08]. （原始内容存档于2012-10-21）. ^ George, Richard; Thomas, Lucas M. Nintendo's History at E3: 2001. IGN. 2011-05-09 [2013-07-08]. （原始内容存档于2013-09-04）. ^ Factor 5 worked with GameCube motion controller. Aussie Nintendo. 2007-07-28 [2014-07-06]. （原始内容存档于2007-09-27）. ^ 21.0 21.1 21.2 Rogers, Emily. A Dolphin's Tale: The Story of GameCube. Dromble Media. 2014-01-07 [2014-07-06]. （原始内容存档于2014-07-05）. ^ Thomas, Lucas M. Before the GameCube Arrived. IGN. 2011-11-11 [2013-07-08]. （原始内容存档于2014-11-16）. ^ Schneider, Peer. The Legend of Zelda: Four Swords Adventures. IGN. 2004-06-02 [2013-07-08]. （原始内容存档于2013-10-12）. ^ East, Thomas. Classic E3 moments: Nintendo reveal GameCube in 2001. Nintendo Magazine UK. 2012-05-29 [2013-07-08]. （原始内容存档于2013-10-04）. ^ GameCube Slogan Revealed!. Nintendo World Report（英语：Nintendo World Report）. 2001-09-03 [2009-10-25]. （原始内容存档于2012-02-13）. ^ Kirby Air Ride. GameTrailers. [2008-03-27]. （原始内容存档于2012-02-13）. ^ GameCube launches in Japan. BBC News. 2001-09-14 [2013-07-08]. （原始内容存档于2015-01-17）. ^ Sato, Yukiyoshi Ike. Nintendo GameCube launches in Japan. GameSpot. 2001-09-13 [2013-07-08]. ^ Becker, David. Nintendo delays U.S. launch of GameCube. CNET. 2001-08-23 [2013-07-08]. （原始内容存档于2014-11-16）. ^ Becker, David. Nintendo reports record GameCube launch. CNET. 2001-11-29 [2013-07-08]. （原始内容存档于2013-10-01）. ^ GameCube gets midnight launch. BBC News. 2002-05-02 [2013-07-08]. （原始内容存档于2014-05-02）. ^ Eggebrecht, Julian. Factor 5 on Dolby Pro Logic II (訪談). IGN. 2002-04-22 [2014-06-24]（原出处存档於2014-11-16）. ^ Hackman, Mark. Nintendo GameCube Unwrapped. ExtremeTech. 2001-06-12 [2013-07-09]. （原始内容存档于2013-12-03）. ^ Shimpi, Anand Lal. Hardware Behind the Consoles - Part II: Nintendo's GameCube. AnandTech. 2001-12-07 [2013-07-09]. （原始内容存档于2013-07-23）. ^ GameCube 101: Graphics. IGN. 2001-01-16 [2008-01-27]. （原始内容存档于2012-02-13）. ^ Gray, Douglas F. Gamecube uncovered - IBM, ATI inside. PC World. 2001-06-14 [2013-07-09]. （原始内容存档于2014-01-04）. ^ Gamecube: A Digital Wonder. IGN. 2000-08-23 [2013-07-08]. （原始内容存档于2014-02-23）. ^ Matsushita allies with Nintendo on next-generation game console. 1999-05-12 [2013-07-09]. （原始内容存档于2014-01-06）. ^ Bonsor, Kevin. How GameCube Works. HowStuffWorks. [2013-07-08]. （原始内容存档于2014-01-06）. ^ Spaceworld 2001: Spicing GameCube Up. IGN. 2001-08-22 [2013-07-09]. （原始内容存档于2014-11-01）. ^ Berghammer, Billy. Nintendo announces Platinum GameCube. Nintendo World Report. 2002-07-24 [2013-07-09]. （原始内容存档于2013-11-05）. ^ Spice Up Your Life. IGN. 2001-12-03 [2013-07-09]. （原始内容存档于2015-04-02）. ^ Iwata Asks: Nintendo 3DS: 3. [2011-01-11]. （原始内容存档于2012-02-13）. Iwata: To go back a little further, the Nintendo GameCube system actually had 3D-compatible circuitry built in [...] Itoi: Nintendo GameCube did? And all the Nintendo GameCube systems around the world? Iwata: Yeah. If you fit it with a certain accessory, it could display 3D images. ^ Serrels, Mark. The Gamecube and the Game Boy Advance Were 3D Compatible!. （原始内容存档于2015-12-27）. ^ Taljonick, Ryan. The 100 Best Easter Eggs of All Time. Games Radar. 2013-04-03 [2013-07-16]. （原始内容存档于2014-05-06）. 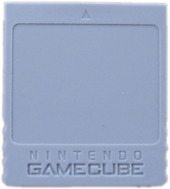 ^ Nintendo GameCube Memory Card 1019. Nintendo. [2013-07-12]. （原始内容存档于2013-07-02）. ^ Nintendo GameCube Accessories. Nintendo. [2009-07-03]. （原始内容存档于2012-09-11）. ^ Plunkett, Luke. The Evolution of the PlayStation Control Pad. Kotaku. 2011-06-28 [2013-07-16]. （原始内容存档于2013-07-27）. ^ Satterfield, Shane. What's inside the GameCube?. ZDNet. 2001-11-16 [2013-07-15]. （原始内容存档于2012-03-07）. ^ England, Kyle. The Legend of the Gamepad: A brief history of Nintendo consoles told with buttons and joysticks.. Nintendojo. 2012-04-05 [2013-07-15]. （原始内容存档于2012-11-30）. ^ GCN Controller: See it in Action. IGN. 2001-07-27 [2013-07-15]. （原始内容存档于2014-11-16）. ^ Graziano, Claudia. 'Nintendo Thumb' Points to RSI. Wired. 1998-12-03 [2013-07-15]. （原始内容存档于2012-10-23）. ^ Powers, Rick. 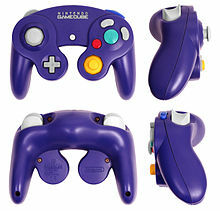 GameCube Controlle. Nintendo World Report. 2001-10-06 [2013-07-15]. ^ Wiley, M. Nintendo WaveBird Review. IGN. 2002-06-11 [2013-07-15]. （原始内容存档于2013-09-23）. ^ Nintendo GameCube Game Boy Player. IGN. 2001-11-18 [2013-07-16]. （原始内容存档于2013-12-24）. ^ Humphries, Matthew. Nintendo's new Wii drops Gamecube compatibility, bundles more games. Geek.com. 2011-08-17 [2013-07-16]. （原始内容存档于2013-06-12）. ^ Plunkett, Luke. Tearing Open The New Wii Reveals Some Crazy Nintendo Decisions. Kotaku. 2012-12-13 [2013-07-16]. （原始内容存档于2013-05-14）. ^ 60.0 60.1 Reece, Mark. Feature: Remembering the GameCube. Nintendo Life. 2011-11-18 [2013-07-19]. （原始内容存档于2013-09-10）. ^ 61.0 61.1 Hinkle, David. Year one: GameCube vs. Wii. Joystiq. 2007-11-19 [2013-07-21]. （原始内容存档于2012-10-21）. ^ 62.0 62.1 Yoder, Benjamin. Will Nintendo Ever Get Third Party Support Right?. VGChartz. 2011-07-21 [2013-07-19]. （原始内容存档于2014-07-24）. ^ East, Tom. History Of Nintendo: GameCube. Official Nintendo Magazine UK. 2009-11-04 [2013-07-19]. （原始内容存档于2014-11-10）. ^ 64.0 64.1 64.2 GameCube Broadband/Modem Adapter - Feature. Nintendo World Report. [2017-11-18]. （原始内容存档于2016-04-06）. ^ 65.0 65.1 ダウンロード. konami,jp. 2005-11-19 [2017-11-25]. （原始内容存档于2005-11-19）. ^ | Nintendo - Customer Service | Nintendo GameCube - Online/LAN. www.nintendo.com. [2017-11-16]. （原始内容存档于2017-07-21） （英语）. ^ PSO Episode I & II for Xbox Returns - Phantasy Star Online Episode I & II Message Board for GameCube. GameFAQs. [2012-11-06]. （原始内容存档于2014-05-28）. ^ | Nintendo - Customer Service | Nintendo GameCube - Connecting over a LAN. www.nintendo.com. [2017-11-16]. （原始内容存档于2017-11-16） （英语）. ^ Thorsen, Tor. DIY developers bring GameCube online. GameSpot. 2003-10-28. （原始内容存档于2017-11-17）. ^ Nintendo Jumps Online. IGN. 2002-05-13 [2013-07-21]. （原始内容存档于2013-12-24）. ^ Ryan, Michael E. Nintendo GameCube: Review. PC Magazine. 2001-11-15 [2013-07-22]. （原始内容存档于2013-07-10）. ^ Nintendo GameCube. CNET. 2001-11-18 [2013-07-22]. （原始内容存档于2013-10-02）. ^ 73.0 73.1 Nintendo GameCube is number 16. IGN Entertainment. [2009-10-15]. （原始内容存档于2012-02-13）. ^ Xbox Vs. GameCube Vs. PlayStation 2: Torture-testing all the video game consoles--in one room, at one time. Popular Mechanics. 2004-12-07 [2013-07-22]. （原始内容存档于2013-08-04）. ^ 75.0 75.1 75.2 Frederick, Jim, and Toko Sekiguchi. "The Console Wars: Game On." Time International (South Pacific Edition) 49 (2003): 56-59. Business Source Complete. Web. July 24, 2013. ^ Ahmed, Shahmed. Japanese GameCube sales figures. Gamespot. [2017-12-08]. （原始内容存档于2017-12-09）. ^ 78.0 78.1 GameCube sales hit $100m. BBC. 2001-11-21 [2017-12-08]. （原始内容存档于2017-12-08）. ^ GameCube sales brisk. CNN Money. 2001-11-29 [2017-12-08]. （原始内容存档于2017-12-08）. ^ Ando, Mariko. Gamecube sales surpasses Xbox, PS2. MarketWatch. 2001-11-29 [2017-12-08]. （原始内容存档于2017-12-08）. ^ Smith, Tony. Nintendo GameCube sales on target to beat initial forecast. The Register. 2001-12-04 [2017-12-08]. （原始内容存档于2017-12-08）. ^ Nintendo GameCube. IGN. （原始内容存档于2014-08-08）. ^ Dyer, Mitch. Ten Incredible Gifts Xbox Gave Modern Gaming. IGN. 2011-11-15 [2013-07-22]. （原始内容存档于2014-04-07）. ^ Moriarty, Colin. Sony's Documentary on PlayStation 2's Retail Dominance. IGN. 2013-02-16 [2013-07-22]. （原始内容存档于2013-02-21）. ^ Buchanan, Levi. Nintendo 64 Week: Day One. IGN. 2008-09-29 [2013-07-22]. （原始内容存档于2013-09-29）. ^ Zackariasson, Peter; Wilson, Timothy L.; Ernkvist, Mirko. Console Hardware: The Development of Nintendo Wii. The Video Game Industry: Formation, Present State, and Future. Routledge. 2012: 158. ISBN 978-1138803831. ^ Profit decline at Nintendo blamed on GameCube sales. seattlepi. 2003-05-22 [2017-12-08]. （原始内容存档于2017-12-08）. ^ Eidos to Pull GCN Support. IGN. 2003-09-05 [2007-07-12]. （原始内容存档于2012-02-13）. ^ Game Companies: Eidos Interactive. GameFAQs. [2007-07-12]. （原始内容存档于2012-02-13）. ^ Nintendo GameCube Price Drops to $99!. Nintendo. 2003-09-24 [2007-07-13]. （原始内容存档于2012-02-13）. ^ Nintendo GameCube Preview Disc. IGN. [2015-08-07]. （原始内容存档于2015-09-25）. ^ Henry Gilbert. The Wii U Is the GameCube (but not the Virtual Boy). GamesRadar. 2013-08-01 [2015-08-07]. （原始内容存档于2015-09-24）. ^ Surf's Up official Press Release. Ubisoft. 2007-04-19 [2007-04-18]. （原始内容存档于2012-02-13）. ^ Ratatouille official Press Release. THQ. 2006-11-06 [2007-04-18]. （原始内容存档于2012-02-13）. ^ Disney Showcases E3 Lineup. Nintendo World Report. 2007-08-02 [2007-04-18]. （原始内容存档于2012-02-13）. ^ Madden NFL 08 official Press Release. Electronic Arts. 2007-04-18 [2007-04-18]. （原始内容存档于2007-12-29）. ^ The GameCube's Legacy to Nintendo and Gaming. Vooks. [2017-03-09]. （原始内容存档于2017-06-27）.